ApoList is a monthly list of articles that deal with the basic machinery of apoptosis and other forms of cell death. This list is available as monthly posts on the website, or you can subscribe to the Apolist to receive it via email. This page and the Apolist are maintained by Cristina Munoz-Pinedo at IDIBELL, Barcelona. Metabolism and cancer articles is a blog including compilations of recent articles on the topic of cell metabolism, cell death and cancer, and their relations. Posted monthly by Cristina Muñoz-Pinedo. 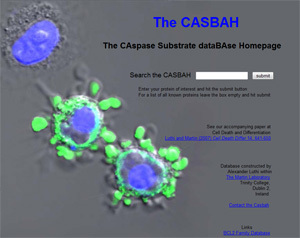 The Caspase Substrate database Homepage (CASBAH) provides a comprehensive list of caspase substrates as a searchable web resource containing information pertaining to all currently known caspase substrates.